When working with abrasive objects, proper grip and protection are as important as each other. The MCR Safety GP1050NT3 Cotton Jersey Nitrile Fully Coated Safety Gloves are made from soft and comfortable cotton jersey, making them incredibly comfortable and easy to wear. Additionally, a smooth full nitrile coating lends the gloves a fantastic level of abrasive grip, ensuring a secure hold on items. 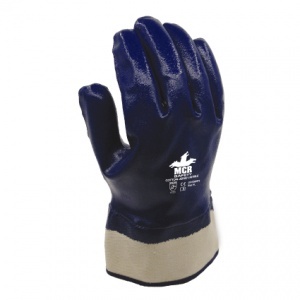 The smooth full nitrile coating on the MCR Safety GP1050NT3 gloves provides them with a good, tacky grip. This makes them ideal for handling abrasive items, providing your hands with secure protection. For even more protection, the gloves also feature a longer safety cuff, helping to keep your wrists safe.